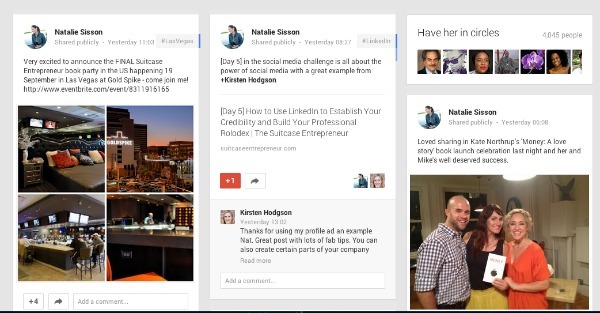 Google Plus is become an overall key tool for you to build your brand, your communities and your influence. In addition Google Hangouts and Google Communities that are part of this social media platform allow you to really reach out and connect further with your audience, potential clients and customers. I’ve personally seen a lot of growth in my following on Google Plus profile by using it consistently on a daily basis posting my latest blog posts, videos, podcasts and photos. I also make sure to include an interesting write up with that URL link, and @mention (much like on Twitter) the people who may find it relevant or are included in it. so they are alerted and can share too. As a result I now have over 4,000 people who’ve added me to their circles which means I come up in their newsfeed and cross their radar on a daily basis. Even if they may not comment or share what I have you can be assured they’re seeing it and reading it too and that’s how you start establishing your authority and trust. I also enjoy reading through others people’s posts on my home feed (especially on the mobile app which is beautifully designed) and plus +1 those I find most interesting, leaving a comment and sharing on my own profile and at the same time by doing that I’m extending and building my network with those people. As you can see this is a similar strategy that works on Facebook, and with more succinct updates on LinkedIn and Twitter. Share your own great content and that of others to create value, goodwill and a community. Visit those circles daily and actually interact with just one of those circles each day. Circles are a really effective way to manage your different interest groups and then actually look at the communities and conversations that you want to be listening to more often and engaging with. So for example you may want to start a `Social Media’ circle and add in experts on this matter so in your daily feed you get the latest and greatest content, tips and strategies. Use keyword searches to identify really relevant people and add them in. This is very similar to finding a page on Facebook. You just go into the Google+ search and you put it in quotation marks, for example “online marketing”. You can search on people and pages. You can also add in all your Gmail contacts for an instant network and way to connect further with contacts you already have. Then simply make sure you add them into the right circles. Also check on people adding you and regularly add them back and put them in circles. Once you’ve put someone in a circle you’ve created, actually go and engage with them by +1 their posts, comment on them and just get on their radar and be interested in what they’re doing. You can also be really strategic about it by curating your circles and the content. It’s going to make it quite easy to target what you want to read and stay connected with the right people and not be overwhelmed by all the information that is on Google+. You can create your own community, much like a Facebook or LinkedIn Group where you just discuss and share useful information and resources to your community, and ask them to do the same, all the while building your authority in that arena and trust. You can also join other communities or you may be invited to join them – so choose wisely and then allocate time daily or a few times a week to go and hang out, ask questions and get questions answered. 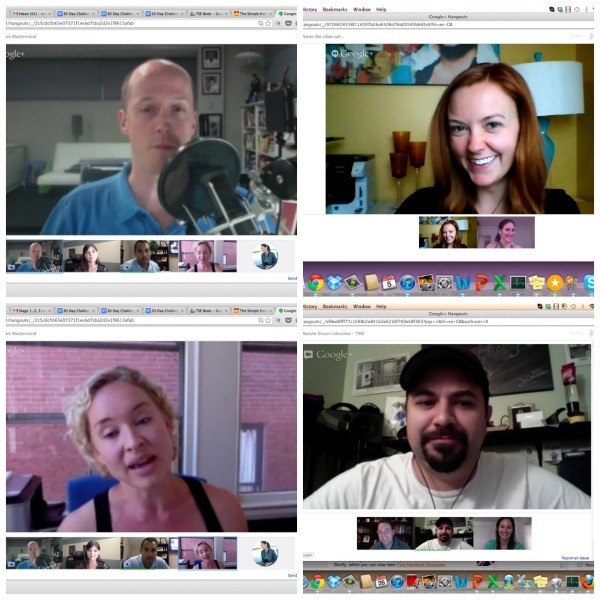 Google Hangouts are a really cool tool to hold for many purposes including a product demonstration, a group coaching session, a training session, a mastermind, a live event like Natalie MacNeil’s Conquer Club Summit, to interview others – and so much more. I’ve done book masterminds, podcast interviews and a 1.5 hour live event for a program launch on Google Hangouts and it’s amazing how much energy it creates. What’s more you can record it direct to YouTube so people can view it live or the recording later which makes them perfect for connecting further with your community, offering up valuable training for customers around your products and services. 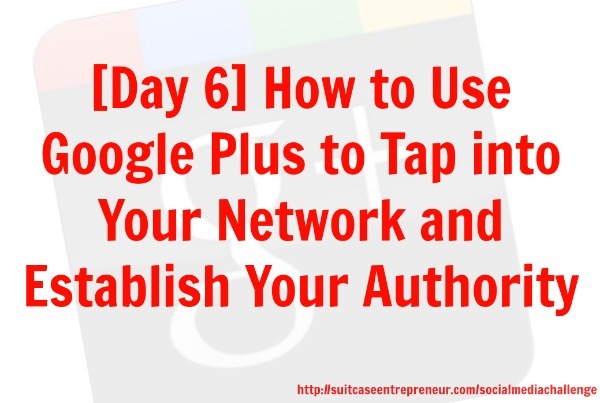 How are you using Google Plus to tap into your network and establish your authority? Share the Social Media Challenge with your friends by directing them here.